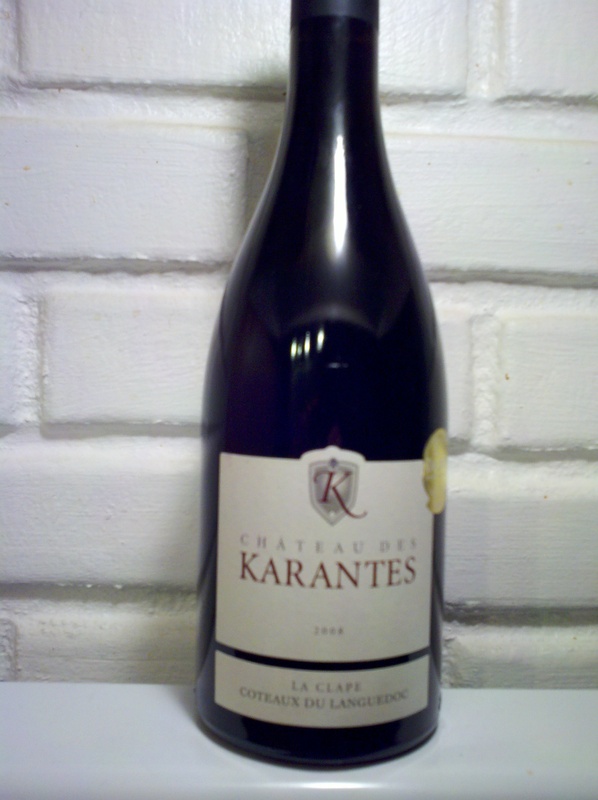 2008 Chateau Des Karantes Rouge | Wine Splash! An amazing wine that is impressive on all levels. It was one of only 12 French reds to win a Gold Medal at the Decanter World Wine Awards in 2010. It won another Gold Medal at the Concours des Grands Vins de Macon and a Silver Medal at the Concours Mondial de Bruxelles. It is a flavorful blend of 50% Syrah, 40% Grenache, and 10% Mourvedre. We tried this wine at a local wine tasting and just loved it! We bought a case but when the distributor delivered the wine, we were able to get only 2 bottles. At $18 a bottle, it received quite an overwhelming response! So yes, we are still searching for more 2008 since 2010 is the vintage that is being sold now. In our glass, dark crimson colors that are deep and very mystical. On the nose, an intense bouquet of dark fruits, vanilla, and spices. The mouthfeel was full bodied, velvety, with a rounded tannin structure. Beautiful flavors of ripe plums, blackberry, spice, and vanilla oak. Subtle, yet with complex layers that flirt and arouse the palate! And a long, creamy finish that displays more vanilla spice and a slight hint of sweet ripe black cherry. Very elegant and approachable for those that enjoy a hearty style red wine. We had this Rouge with Sartori BellaVitano Gold Cheese which is a bold and creamy parmesan style cheese. We also had it with a Dubliner cheese and they were both fantastic! This wine would also pair well with a beef dish, fillet mignon, pasta with a rich tomato sauce, or an eggplant parmesan. Can we say much more about this wonderful wine except it is one to put on your bucket list. We are sure even the 2010 is going to be high quality as well. We give the 2008 Chateau Des Karantes Rouge – Coteaux Du Languedoc La Clape a well deserved 95 pts. It has everything we love in a red wine! Complex, layered, robust, rich dark fruits, spice, vanilla, oak, rounded tannins, and a long lingering finish. This is the “Did I die and go to Heaven” wine! Yes, we are going to purchase the 2010 and we will open it early so we can stock up this time before it runs out. That is the only downfall of cellaring a wine for too long. If you love it, that vintage will be hard to find when you start your search again. If you have a 2008 vintage of this wine, it will cellar well until 2016. But I wouldn’t wait much longer to drink it. And when you do open it, give us a call and we can help you finish the bottle! WineSplashing! !